We have another trend coming our way. Nail polish with metal particles that respond to a magnet being held close to them, thus creating beautiful effects on your nails. These aren't entirely new - people on the other side of the globe have had them on their fingertips back in 2007 with the brand Le Magnetique, and then in 2010 with Alessandro and Essence polishes. I had heard of these polishes before but passed them by as unattainable. Finally they are being sent to the Americas in 2011. LCN is a German brand, and Layla comes from Italy. I want to share a quick overview of what the brands are offering, and how this stuff works. First off, both of these brands are claiming to be Big-3-free. Their formulas don't contain DBP, Formaldehyde or Toluene. I say claim because I have not seen an official list of what they do contain, but I'm sure these high-end brands aren't going to mess with their customers. So, this is great news for people (like me!) who are avoiding these ingredients. Of course, if you have allergies to metals, these polishes have a whole different reason to be skipped. Cool, right? A few more pics, details and my own thoughts after the jump! When I stumbled across these my first reaction was that they were awesome. Secondly, that they should be easy to pull off. Once you figure out how to hold the magnet at the correct angle and distance you should be on your way to fast, easy nail art. Thirdly, that they are designed to be a one-coat wonder. (That is so me.) And lastly, that all the colors have this great metallic shimmer thing going on that I really dig. I also noticed that these tend towards the neutral/cool side of the color spectrum. So, I'm really digging these! LCN offers 8 colors at this time, and two design magnets, which are sold separately. The designs are either a star pattern or parallel lines. 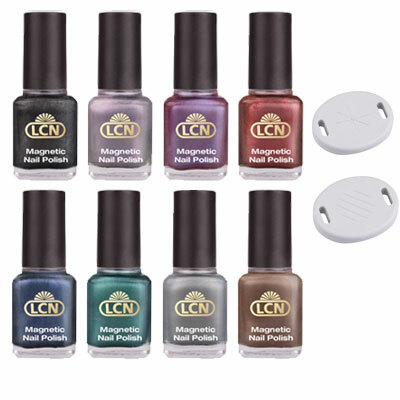 You can buy these directly from the LCN USA webstores, either $9.90 for each 8ml polish and $19.90 for a single magnet, or $115.90 for the whole set of 8 colors and 2 magnets. Layla Cosmetics has 12 colors in their lineup, and each bottle of polish has the magnet attached to the top of the cap. Currently they only do the line design. Their formula counts as B3+, because it excludes camphor. Each 10ml bottle is retailing for about $15.50, with various eTailers stocking the product. Many people see this as being the next big nail trend, and I agree. I'm sure the major brands will catch on shortly, and then even drugstore brands will start stocking things called MagNEAT, Mag-ic and what-not. I'm cool with that - hopefully it will bring the price down. It seems that no matter who makes them the technique is the same, so we should have interchangeable magnets and polishes at our fingertips in no time! I picked up the LCN complete set, and will be happy to snag other single bottles of different colors if I truly love the look on me. My plan is to get the set and play with all sorts of magnets to see what can be done with them! Count on a review, of course. Are you going to try it? What colors are catching your eye? Were you fortunate enough to try this type of polish in past years?